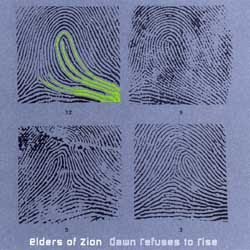 "The Elders of Zion are a hard-drive based cut and paste quartet split between Seattle and San Francisco. Mixing equal parts hip-hop, dub, drone rock, and noise, the Elders' debut recording, Dawn Refuses to Rise, seamlessly fuses progressive politics with a beautifully consistent exploration of genres. Moving from the French dance floor cut-up of 'Disco Communiste' (featuring dialogue sampled from Jean-Luc Godard's legendary 1967 New Wave classic, La Chinoise) to the punk reggae of 'Hymn For a New October War,' (built around a recording of a Russian cantor begging for forgiveness,) the Elders typify the new artistic sensibilities of post-Cold War hipsters piecing together the political detritus of globalization." I bought this album about 4 years ago after hearing an mp3 of the first track. Some great samples on this album taken from field recordings, protests, and various political demonstrations. The intensity of "#1 in Gaza This Week", and the badass samples in "What's Your Badge Number?" makes this a highly recommended download. "We know that the best noisemakers are not necessarily the best peacemakers."